I have just returned from the American Vacuum Society Symposium in Tampa, Florida. During the Vacuum Technology Division Sessions, we were updated on the NIST project to develop photonic based vacuum measurement standards. In order to introduce the topic, below is an excerpt from my book Understanding Modern Vacuum Technology, 2nd Ed. As this work is being compiled, there is groundbreaking work being done at NIST in the Thermodynamics Group. This is in alignment with the “NIST on a Chip” program which has a goal of having reference standards based on quantum phenomena that can be scaled down to extremely small packages. The pressure standards that are in use today are manometers that are evolutionary advances of the mercury barometer that Torricelli developed in 1643. While the principle behind the primary standards is simple, the manometers are operationally complex, requiring accurate determination of temperature, density, gravity, speed of sound, and ultimately column height. The manometers are large instruments (up to 3m tall) and contain up to 250kg of hazardous mercury. Mercury manometers are still used at eleven National Metrology Institutes, including NIST. The NIST 13 kPa, 160 kPa and 360 kPa Ultrasonic Interferometer Manometers (UIMs) use ultrasound pulses to determine column heights with a resolution of 10 nm or a pressure resolution of 3.6 mPa and provide the world’s lowest pressure uncertainties. Once the instrument is set up, it takes about a minute to take a data point. Figure 4 45 10 kPa Ultrasonic Interferometer Manometer in the foreground and the 360 kPa UIM in the background. The 260 Pa UIM stands three meters tall and provides the nation with best-in-the-world capabilities for measuring absolute and differential pressure from 1 Pa to 360 kPa. The goal is to replace the oil and mercury manometers with a standard that can be easily transported between national labs, researchers and industrial users. Once the photonic based standard is developed, NIST will be able to export a primary standard to an end user. The photonic based method is to make vacuum and pressure measurements using Fabry–Pérot optical cavities to measure the interaction of light with a gas. This represents a disruption in pressure measurement technology and a way of realizing and disseminating the pascal, the SI unit of pressure. The basis of the optical technique is a Fabry–Pérot cavity, where two highly-reflecting mirrors face each other. Two Fabry–Pérot cavities built on a single low-expansion glass spacer, with one of the cavities serving as a vacuum reference. Figure 4‑46 shows a schematic for a dual Fabry–Pérot device. A laser shines in the end of one cavity and the transmitted light is detected at the other end, after bouncing back and forth inside the cavity multiple times (depending on reflectance of the mirror coatings). When the laser light entering the cavity has a wavelength such that an integer number of half wavelengths exactly fits between the two mirrors, a resonance occurs along with a detected signal intensity maximum at the detector, which is used in a stabilization feedback loop to lock the laser into resonance with the cavity. Every once in a while, I find a really interesting piece of vacuum technology history. This APS article provides additional insight into Torricelli and his work. We have been using Torricelli’s barometers as pressure reference standards for the best part of 400 years. This piece is taken from the American Physical Society News Letter October 2017, Vol 21, no. 9 in full, unedited as APS directs below. It is my hope that you become aware of the APS News resource and maybe you also will find something that interests you there. Ed. Note: This month’s column was written by guest author Richard Williams. 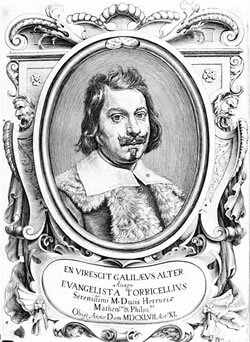 Evangelista Torricelli, born of a humble family, eventually rose to the top of the Italian intellectual community. He led Italy, and then the world beyond, to resolve a two-thousand-year-old philosophical debate about vacuum and the nature of space. He did this by performing and understanding a single elegant physics experiment. The apparatus he used was also a practical invention–the mercury barometer. Torricelli was born at Faenza, Italy on October 15, 1608. “Left fatherless at an early age” he was sent to Rome for his education. His achievements there brought him to the attention of Galileo in Florence. He came there and lived with Galileo. Galileo was preoccupied with a problem of Tuscan well diggers who were frustrated in their attempts to raise water more than about ten meters with lift pumps. When they tried to raise it higher, the water separated from the pump plunger and would go no farther. Could this be due to a vacuum forming under the plunger? They asked Galileo why the water could not be pumped higher. He considered the problem seriously, but died in 1642 with it still unresolved. Then, in 1644, Torricelli took up the problem. After some study of earlier experiments he did one of his own. The apparatus was a glass tube about a meter long, sealed at one end. He filled it with mercury, covered the open end, and inverted it over a dish of mercury. This was not as easy as it sounds today. Glass tubes at the time were fragile and hard to come by. They often broke when filled with a kilogram of mercury. But with the help of a skilled assistant the experiment was done. The mercury in the tube fell and stabilized at a level about 76 centimeters above the level in the dish. Torricelli surmised correctly that the mercury rose in the tube because of the weight of the atmosphere pressing down on the mercury in the dish, and that the space above the mercury column was a vacuum. It was the first time that a vacuum had been created in the laboratory, and understood as such. The concept of a vacuum had been contentious since antiquity. Both Plato and Aristotle thought the existence of a vacuum to be impossible, against Nature. In medieval Europe, this was summed up by the expression: “Nature abhors a vacuum.” To discuss a vacuum became heretical and dangerous. The word “vacuum” first appeared in the English language in 1550, introduced by Thomas Cranmer, the Archbishop of Canterbury, who composed the Book of Common Prayer, the central document of the Church of England. The phrase he used, as part of a theological argument, is cited in the Oxford English Dictionary: “Naturall reason abhorreth vacuum, that is to say, that there should be any emptye place, wherein no substance shoulde be.” This was the sanctioned view, but, with the accession of the Catholic Queen Mary in 1553, the winds of orthodoxy shifted. Cranmer was convicted of heresy in 1555, and was burned at the stake the following year. Torricelli’s achievement brought the concept of vacuum from the dialectics of antiquity into experimental physics. Mindful of the contention around the idea of vacuum, he did not make his experiment public at first, but disclosed it only in letters to a friend, Michelangelo Ricci. In October, 1644, the French scientist Marin Mersenne visited Torricelli, who repeated the experiment for him and gave him copies of the letters to Ricci. Mersenne took these to Blaise Pascal and others in France, disclosing Torricelli’s work publicly for the first time. Pascal immediately understood the meaning of the experiment, and repeated it in 1646. He believed that the atmospheric pressure should decrease with altitude, and engaged a relative and some friends to carry a barometer up a mountain in the south of France. They found the anticipated decrease of pressure with altitude, laying the foundation for the science of meteorology. Pascal understood the pressure to be equal to the weight of the atmosphere per unit area. He combined this with the surface area of the earth and calculated the total mass of the atmosphere. His result differed by less than 30% from the currently accepted value as cited in The Handbook of Chemistry and Physics. About the calculation, Pascal noted that “a child who knows addition and subtraction could do it,” a strong endorsement of the French school system. Torricelli’s apparatus was the first mercury barometer. Minor improvements were later made to increase the precision of the readings, but the basic design remained unchanged. In meteorological stations around the world it served as the reference standard for measuring atmospheric pressure for more than three centuries, perhaps a record time for an instrument to be used with the same design. Finally, in 1977, the US National Weather Service announced that the mercury barometer would be replaced as the reference standard by a recently developed piezoelectric quartz crystal pressure transducer. Torricelli stood at the nexus where, with a single elegant experiment, vacuum and the nature of space, defined in philosophical terms for two thousand years, gave way to the modern view, defined by experimental physics. In the twentieth century, physicists went far beyond this. They found, not an “emptye place, wherein no substance shoulde be,” but rather a vacuum filled with wonders: electromagnetic radiation, including that from the last gasp of the Big Bang; a sea of virtual particle-antiparticle pairs; a space bent out of shape by gravitational warping–all unimaginable to earlier physicists. Following his work on the barometer, Torricelli did research in mathematics and physics. His formula for the efflux of a liquid from a small orifice in a container is still known as Torricelli’s Theorem. He died in Florence in 1647, at the age of thirty nine. A commemorative statue of him was erected in Faenza in 1864. MKS Instruments just released a new handbook that describes many of the basic design structures and processes for semiconductors. The first section has articles describing the basic transistor structures for the devices being built today including planar and 3D structures. It starts off with a discussion of the simple P-N junction and goes right up through the transistor technologies up to the cutting edge 3D FinFET structure. It has definitions of all of the common diode and transistors. Click the image to go to the MKS Semiconductor Devices and Process Technology ebook download page. The handbook goes into the silicon, dielectric and interconnect materials used and their fabrication methods. It has a wealth of information of the process sequence from raw wafer to finished product. The second section of the handbook includes vacuum technology; some vacuum basics, pump information, gauging and components. MKS has a wealth of vacuum metrology solutions and the majority are mentioned in the handbook. What is very helpful is that the articles show how all of the MKS technology solutions can be used together as subsystems within a larger system. If you work in a section of the industry and would like to be introduced to other processes in the industry, then I would encourage you to check this out. It will give you a good encyclopedia level education in semiconductors as well as see all of the MKS technology solutions. 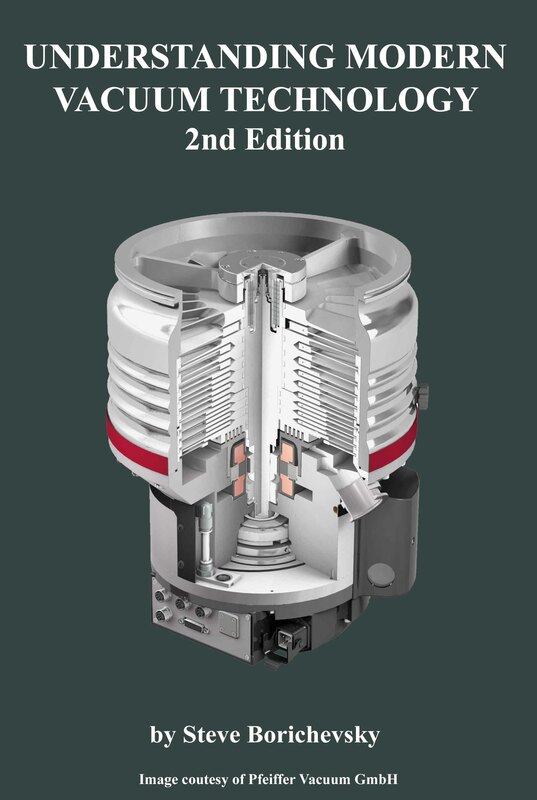 In other news, in case you missed it, the second edition of Understanding Modern Vacuum Technology is available. There is a discount available for readers of this blog. LIGO is an acronym for Laser Interferometer Gravitational-wave Observatory. The purpose of LIGO is to detect gravitational waves. Albert Einstein predicted the existence of gravitational waves in 1916 in his general theory of relativity. Einstein’s mathematics showed that massive accelerating objects (such as neutron stars or black holes orbiting each other) would disrupt space-time in such a way that ‘waves’ of distorted space would radiate from the source. In the semiconductor industry, I am concerned with a final product on a microscopic, nanometer scale on microprocessor chips. LIGO is at the other far end of the curve dealing with massive object colliding in space. The problem is that detecting gravitational waves is an extremely difficult task. The waves will cause distortions in space on earth that are shorter than the dimension of an atom’s nucleus. In fact the distortions are on the order of 1/10,000th of the diameter of an atomic nucleus. The detector has to be super sensitive and in a very quiet location. Vacuum technology plays a key role in this experiment. LIGO consists of two interferometers, each with two 4 km (2.5 mile) long arms arranged in the shape of an “L”. Each chamber encloses 10,000 cubic meters of volume. One interferometer is located in Hanford, Washington and the other in Livingston, Louisiana. The reason for two is that the earth is a very active place with lots of human hustle and bustle. There are earth quakes and storms. So if the detectors both capture the same signal, then that is strong evidence that the signal is a gravitational wave. Gravitational waves sent out from a pair of colliding black holes have been converted to sound waves, as heard in this animation. On September 14, 2015, LIGO observed gravitational waves from the merger of two black holes, each about 30 times the mass of our sun. The incredibly powerful event, which released 50 times more energy than all the stars in the observable universe, lasted only fractions of a second. In the first two runs of the animation, the sound-wave frequencies exactly match the frequencies of the gravitational waves. The second two runs of the animation play the sounds again at higher frequencies that better fit the human hearing range. The animation ends by playing the original frequencies again twice. As the black holes spiral closer and closer in together, the frequency of the gravitational waves increases. Scientists call these sounds “chirps,” because some events that generate gravitation waves would sound like a bird’s chirp. The lasers are operated in a vacuum level on the order of 10-9 torr. This ensures that there are no air currents causing distortion of the laser beams either through transmission of sound or thermal energy. Also it lessens the chance of particle movement in the vacuum system. LIGO’s vacuum tubes were constructed of spiral-welded 3 mm thick 304L stainless steel. With its relatively low carbon content, 304L steel is resistant to corrosion, especially at the critical welded seams. The 1.2 m diameter beam tubes were created in 19 to 20 m-long segments, rolled into a tube with a continuous spiral weld. To prevent collapse, LIGO’s tubes are supported with stiffener rings that provide a significant layer of resistance to buckling under the extreme pressure of the atmosphere. The tubes must withstand these stresses for at least 20 years. Evacuating the chambers took 40 days of constant pumping to evacuate them to their optimal operating pressure. In that time, turbomolecular pumps removed the bulk of the air in the tubes while the tubes themselves were heated to 150-170 degrees C for 30 days to drive out residual gases. The gases that remain in the system are primarily H2 and water vapor. There are liquid nitrogen cryogenic panels in place to capture the stray water molecule and ion pumps to capture H2 gas. There is so much more technology involved in the LIGO detectors. I encourage you to visit the LIGO website. Although LIGO depends on extreme vacuum engineering, the vacuum technologies involved are explained in Understanding Modern Vacuum Technology. NOTE: On June 1st, 2017, LIGO made their third detection of a gravitational wave event from the collapse of 32 solar mass black hole and a 19 solar mass black hole forming one large black hole of 49 solar masses. The means that two solar masses of material were transformed into energy by the collision. Most vacuum technologist are familiar with the construction of a Bayard-Alpert gauge. A filament emits electrons that are accelerated into a grid where ions are formed. Ions striking the collector cause a current to flow through an ammeter which is proportional to the pressure inside the gauge. Back in the 1990s, Granville-Phillips embarked on a project to create an inexpensive OEM gauge for the semiconductor market. We had just finished the development of the Stabil-Ion® gauge. The Stabil-Ion was designed to be an extremely stable and reproducible gauge (Arnold et. al. 1994) to serve customers with the demanding vacuum requirements. We learned many techniques to make a gauge stable and reproducible, but it was not attractive to the OEM market because of the price. We turned out attention to a lower cost, compact gauge that could be offered at a lower price. One of the problems with all compact gauges is that volume inside the grid where the ions are formed is much smaller than a conventional B-A gauge. This means that the number of ions that are formed in the region where they can be collected is greatly reduce. So it is important that we collect as many ions as possible. Inside a B-A gauge grid, ions formed with certain angular momentum values cannot be collected because they form stable orbits around the collector as shown below. A dual collector design was introduced to solve that problem. Since the grid is at 180 volts and the collector is at 0 volts the electric field well has as saddle shape. The analogy would be like trying to place a basketball on the back of a horse. It will try to fall off either side of the horse rather than staying on its back. The result of this design was that the sensitivity for this gauge is 3 to 4 times the other gauges in its class. You can lean more about Bayard-Alpert gauges and other vacuum metrology devices by reading Understanding Modern Vacuum Technology. MicroIon and Stabil-Ion are registered trade marks of MKS Instruments, Inc.
What is a Watt Balance? These are “exciting” times for meteorologist. In 2018, it is expected that all of the fundamental SI units will be defined, including the kilogram. Right now, a kilogram artifact sits in France. It is the kilogram which is agreed that will be the definition of the kilogram, period. So if it shifts by a microgram, the reference standards in the national laboratories will shift by a microgram. Wouldn’t it be better to have a definition of the kilogram based on fundamental constants of the universe rather than an artifact? That is what is going on right now. First, take a look at this short video that describes a watt balance is and how it works. This will help you understand the video that follows. And of course, there has to be some vacuum technology involved! The NIST-4 watt balance has measured Planck’s constant to within 34 parts per billion, demonstrating that the high-tech scale is accurate enough to assist with 2018’s planned redefinition of the kilogram. The watt balance is shown sitting in the bottom half of its vacuum chamber (left) and with the vacuum dome installed (right). YouTuber Veritasium takes us into the National Institute of Standards and Technology to see one of the American standards. You can learn much more at the NIST Physical Measurement Laboratory site.